"A cheap but tasty, hearty soup that you'll always have seconds of. Serve fresh, with bread if desired." Place pork chops, paprika, oregano, garlic powder, salt, pepper, chili powder, bay leaf, chicken broth, water, and soy sauce in a large stock pot. Bring to a boil, uncovered, then reduce heat to medium low and let simmer for 1 hour. Remove the pork chops and set aside to cool. Whisk 3/4 cup of the cooking liquid with the flour; set aside. When the pork chops are cool remove and discard any bones or fat. Chop or shred the meat into bite size pieces. Add the potato, broccoli, carrot, onion, celery, and cooked pork back to the pot. Bring the mixture to a boil, stir in the flour mixture. 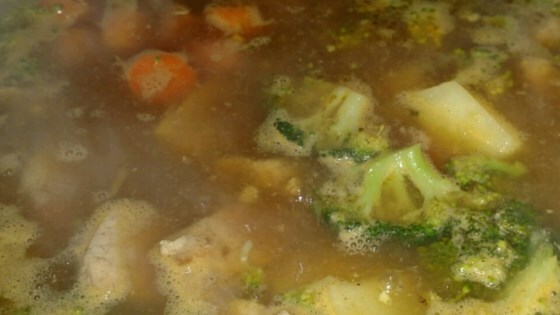 Reduce heat and simmer for 1 hour. Remove the bay leaf and gently mash the potatoes before serving. See how to make traditional Chinese wonton soup. It was good but I would skip adding any additional salt and use low sodium broth. The whole family loved this. I saved a step by pan frying some thin chops and placing everything together to simmer for an hour. I also added some mushrooms for texture. Lovely! WOW this was fantastic! I followed the recipe and only made one change, I added garlic. We LOVED this! !